Cognitive Behavior Therapy is a treatment for OCD that uses two scientifically-based techniques for changing a person’s behavior and thoughts: Exposure and Response Prevention therapy (ERP) and Cognitive Therapy. CBT is conducted by a cognitive behavior therapist who has special training in treating OCD. In ERP therapy, people who have OCD are placed in situations where they are exposed to their obsessions and gradually prevented from performing the compulsions that usually ease their anxiety and distress. The first step in ERP is for you to describe to your therapist all of your obsessions and compulsions. You have to be honest and tell him or her everything. Otherwise, he or she won’t be able to help you as much. Once you’ve described all your obsessions and compulsions, you and the therapist will arrange them in a list, ordering them from things that don’t bother you much at all to things that are the most frightening for you. Then, the therapist would ask you to complete a task that involves one of the things on your list. But don’t worry; the therapist will start with something low on your list – something he or she thinks you can handle. Let’s say you have an obsessive fear of germs in public places, and that fear is pretty low on your list in terms of how much it scares you. Your therapist will design a task for you that exposes you – or makes you face – that fear. The task might be encouraging you to touch a public doorknob that you believe is dirty. Here’s where the “response prevention” part comes in. If your usual response would be to wash your hands immediately after touching the doorknob, the therapist would ask you to wait a period of time before you wash your hands. As you repeat this exposure task (touching a public doorknob), the therapist would probably ask you to wait longer and longer periods of time before you wash your hands. Over time, this gradual exposure and delayed response would help you learn to control your fear of germs in public places without washing your hands. It may seem weird, but this new way of confronting your fears head-on would actually lead to fewer and less intense fears or obsessions about germs. Your brain basically learns that nothing bad happens when you stop performing compulsive rituals. You’d probably feel very upset when you first touched the doorknob – maybe even feel a little panicked. But the good news is that the body has a wonderful capacity for something called “habituation” – anxiety will eventually go down without doing anything but letting time pass. It’s something like jumping into a pool of cold water. When you first jump in, the water may be so cold that you shiver. But after a while, your body gets used to the cold temperature – it habituates – and you feel fine. When your therapist helps you with ”exposures” like this (or other, more difficult kinds of situations involving your fears) over a period of time, your anxiety shrinks until it is barely noticeable or even fades entirely. The therapist is then able to help you gain confidence and learn special skills to control the compulsions through the second form of therapy, Cognitive Therapy. Cognitive Therapy for OCD focuses on the experience of negative thoughts. While most people easily dismiss such thoughts (e.g., “That’s a silly thing to think”), some people have certain beliefs that thoughts are always important. So instead of being able to just forget about these negative thoughts, their beliefs cause them to react differently and might make them think “I’m a bad person for having such a thought!” Research shows that believing that negative thoughts are important and attempting not to have “bad” thoughts actually produces the opposite effect! Cognitive Behavior Therapy may seem unusual. You may even doubt that it could possibly work. After all, you’ve probably already tried to resist your compulsions without much success. But with the right therapist and enough time and support, CBT has helped many thousands of people (children, teens and adults) control their OCD. Most CBT treatment is conducted at a therapist’s office (or other location) once a week with exercises to practice at home between sessions. If the OCD is very severe, more frequent sessions might be needed. Not all mental health professionals are trained in ERP therapy, so it’s important to find one who is. 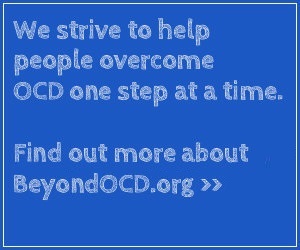 Beyond OCD can help you and your parents find a treatment provider.